Pixentia Resources | Datasheet on "SumTotal Business Workshops"
Developing a complex human capital management system into a powerful business tool can be challenging. Preparation is essential to a successful outcome. 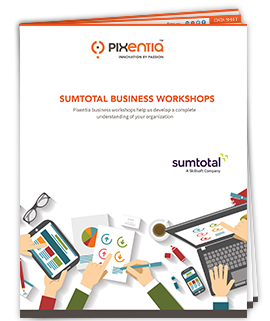 Pixentia’s sumtotal business workshops help you define an effective approach for implementing and configuring your sumtotal solution. Focusing your business objectives, we ensure the means, methods to quantify, monitor and report on your results, so you can measure and report on the business impact of your project.